February is National Pet Dental Health Month, and to help you get a jumpstart on your pet’s dental care, 1-800-PetMeds is giving away Vetradent Dental Wipes, Vetradent Dental Spray, and Vetradent Water Additive to 3 lucky winners! As most pet parents know, your pet’s dental care is just as important as yours, and since it is National Pet Dental Health Month, we want to express the importance of keeping your pet’s mouth clean and healthy. Your pet’s dental care is just as important as yours! Since it is National Pet Dental Health Month, we want to express the importance of keeping your pet’s mouth clean. Unfortunately, by the age of 3, approximately 80% of cats and dogs have some form of periodontal disease. Dental disease can be prevented if you routinely take care of your pet’s teeth. The best thing you can do to keep your pet’s mouth clean is to brush your pet’s teeth regularly. It is recommended to brush daily; however, if daily brushing isn’t feasible, there are many ways to help fight bacteria in between teeth brushing sessions. Breath fresheners, dental chews and treats, and rinses and water additives are all great additions to supplement your pet’s healthy dental routine. Vetradent Water Additive, Dental Wipes, and Dental Spray all help reduce plaque and tartar, freshen breath, and are simple to administer! The Water Additive is a colorless, odorless, and tasteless solution that can easily be added to your pet’s water dish. Vetradent Dental Spray features a no-startle silent spray, which is perfect for skittish pets. 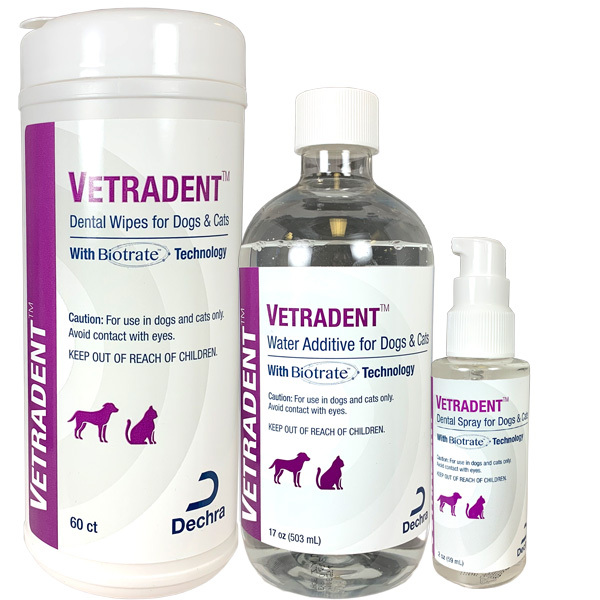 In addition, the Vetradent Dental Wipes are a perfect, quick on-the-go dental product for pets that have a vanilla flavor your pet will love. Each Vetradent product contains Biotrate Technology that helps control the growth of tartar and plaque through preventing the growth of bacteria in your pet’s mouth. All Vetradent products can be used on both dogs and cats and are sold separately. Win a FREE Vetradent Prize Pack for your dog or cat! Is brushing your pet’s teeth a hassle? Help keep their mouth clean with oral brushless care like Vetradent! Just leave a comment below, and you could win a Prize Pack that includes ALL THREE of these Vetradent products from 1800PetMeds! Three winners will be chosen at random Monday, March 4, 2019, so everyone who participates has a chance to win! There will be a total of three (3) winners. (Limited to residents of the U.S.) Good luck! Congratulations to the drawing winners! Look for an email from us with further details. ← Is it safe for dogs to eat tomatoes? I have a 10 year old Yorkie withthe worst breath ever. Yes….the brushing is a job because my dogs hate me prying their mouths open….. I purchased a dog teeth cleaning product with a brush a couple of years back. The only thig I can say have any of you tried to brush the teeth of a pissed of Badger or Wolverine. That’s what the ordeal equated to with my furry K( companions. However I would like to see a product that works and much easier to introduce because I would love to keep there teeth cleaner. I would love to give this product a try for my 3yo husky and my 2yo chihuahua.